Market volatility and concern over the political climate helped drive a four-point decline in the March Spectrem Affluent Investor Confidence Index (SAICI®) to 8. 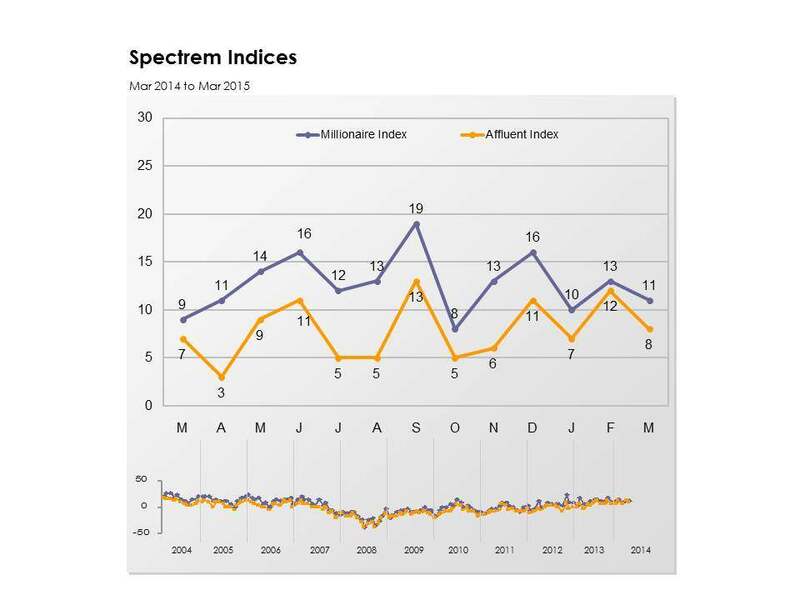 The Spectrem Millionaire Investor Confidence Index (SMICI®) dipped 2 points to 11. The indices measure the investment confidence and outlook of households with more than $500,000 of investable assets and more than $1 million of investable assets, respectively. The March SMICI is down 2 points from January 2014, while the SAICI is down by 1 point from the same period. After reaching a five-month high in February, the indices were impacted by a combination of market and household factors. Speculation over when the Federal Reserve would raise interest rates sparked dramatic drops in the Down Jones industrial index during March. This, in part, has driven affluent investors back to the sidelines, according to a Spectrem Group investment preferences survey conducted earlier this month. The number of investors who indicated they would not invest in the coming month rose to a four-month high in March. While there was a decline in affluent investors who said they would invest in stocks and stock mutual funds, there was also a decline in investors who said they intended to invest in cash in the short term. Affluent investors surveyed by Spectrem Group also indicated a decline in confidence in the economy as well as household assets and income. This is reflected in a drop in the Spectrem Affluent Household Outlook, which dropped nine points in March, the lowest reading since October 2014. In addition to market conditions, affluent investors said that they considered the current political climate to be as serious a threat to achieving their household’s financial goals at this time. Tensions between the White House and Congress were exacerbated in March over several issues, including nuclear talks with Iran, the controversial appearance before Congress of Israeli Prime Minister Benjamin Netanyahu, and the Senate holdup of confirmation of Loretta Lynch, President's Obama's nominee for attorney general. This is another factor in the decline in the March indices.